Everyone knows Julia loved French cuisine, but Julia's first culinary love was not French. Julia's first romance with food was in fact, nowhere near France. Her first love affair with food was in Kunming, China, where she and her future husband Paul slowly but surely fell in love. Julia served in Kunming during the latter part of World War II, arriving in the city shortly after Paul. They were both in the OSS, the precursor of the CIA. The agents serving in Kunming were actually forbidden to travel out of bounds, but that did not stop Paul and Julia from seeking out new culinary adventures every chance they got. The city's name by the way, translates roughly to the City of Eternal Spring, and the weather is mild year-round, similar to California, where Julia grew up. There are, in addition, many interesting cultural sites in hiding amidst the blue mountains and eucalyptus trees. The Stone Forest is the first wonder of the world and in the sixth lunar month there's a festival celebrated there with folk dances and wrestling competitions. There is the Dianchi Lake, silhoutted by mountains in the shape of a sleeping woman. It's said the lake below are the lady's tears over the loss of a loved one. And there is a Taoist temple a Chinese general built for a woman he loved, which is today home to the third largest bronze bell in China. Eternal love in the eternal city of spring ... It'd be a great place to say you fell in love with someone, no? "American food in China was terrible; we thought it was cooked by grease monkeys," Julia recalls in a Washington Post article. "The Chinese food was wonderful, and we ate out as often as we could. This is when I became interested in food. There were sophisticated people there who knew a lot about food. I just loved Chinese food." Julia learned about Peking Szechuan, Cantonese, Annamite and Fukien techniques while in Kunming, and she and Paul went on forbidden forays to out-of-bounds restaurants all the time, trying everything they could. In a letter home, Paul admired Julia for being so gutsy and going with him on these food adventures, as well as her unflappability whenever they encountered adversity on these excursions. One of their first meals together in Kunming is mentioned in the book A Covert Affair by Jennet Conant. It was bowls of eels and garlic. Behind a nearby pink screen they could hear a rather unappetizing sound while they were eating. Apparently a general had drunk too much and become ill, and they could hear him vomiting behind the screen. "It was fortunate our two gals were tough and worldly," Paul wrote in a letter back home. "There's something about a Chinese general vomiting a few feet away that might have taken the fine edge off the bowls of eel and garlic we were eating." Julia and Paul spent much of their free time on these forbidden foodie forays, sometimes paying for it later with a bout of dysentery, but that didn't seem to deter them in the slightest. According to a different book, the last meal Julia and Paul ate together in Kunming included spring rolls, long leaf cabbage and Yunnan ham, winter mushrooms with beet tops and last but definitely not least, Peking duck. Julia loved Peking Duck. In a 1974 New Yorker interview, Julia told an interviewer, "I would be perfectly happy with only Chinese food. Either French or Chinese. Could live with only Chinese." It was a surprising confession to many, but even though Julia never cooked Chinese food, she continued to eat it quite often. It was, after all, Chinese food that had brought her and Paul together in the first place, for what turned out to be an unforgettable lifetime romance. One of the most ingenious dishes for which Kunming is known, is steampot chicken. Books about Julia's life tend to brush past her Kunming culinary adventures, so I am not entirely certain it is one of the many dishes Julia tried while she was serving in the Yunnan province, but it is certainly a dish worthy of trying if you ever go, and I suspect she would have sampled a dish the region is so well known for. The Yunnan steampots are rather ingenious devices. Made from red clay in the Yunnan province, the Pot features a tube in the center with an opening at the top. The device looks similar to a bundt cake or angel food cake pan, but has a lid, and is generally a lot prettier and more elegant than an old cake pan. 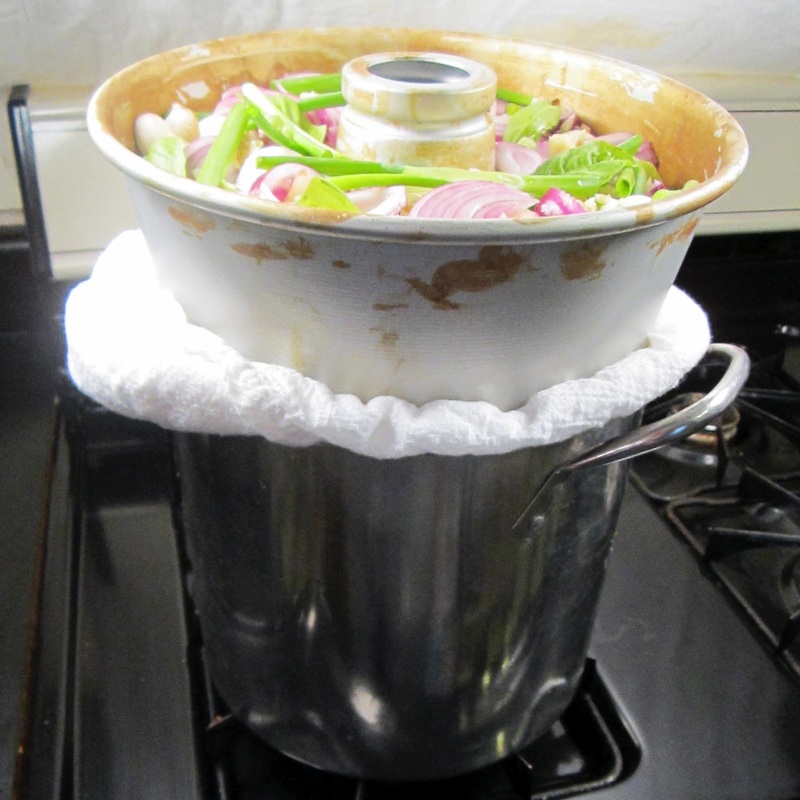 You layer the food in the pot by putting the longest cooking items on bottom. The pot is then set above a large tall pot with water in it. As the water boils, steam rises into the funnel and condenses on the clay pot lid. The purified distilled water has nowhere else to go but down into the slow-cooked ingredients, extracting more flavor drop by drop. Just looking at this like a chemist, the method should slowly but surely extract more flavor from the ingredients than if you had added liquid all at once at the beginning. 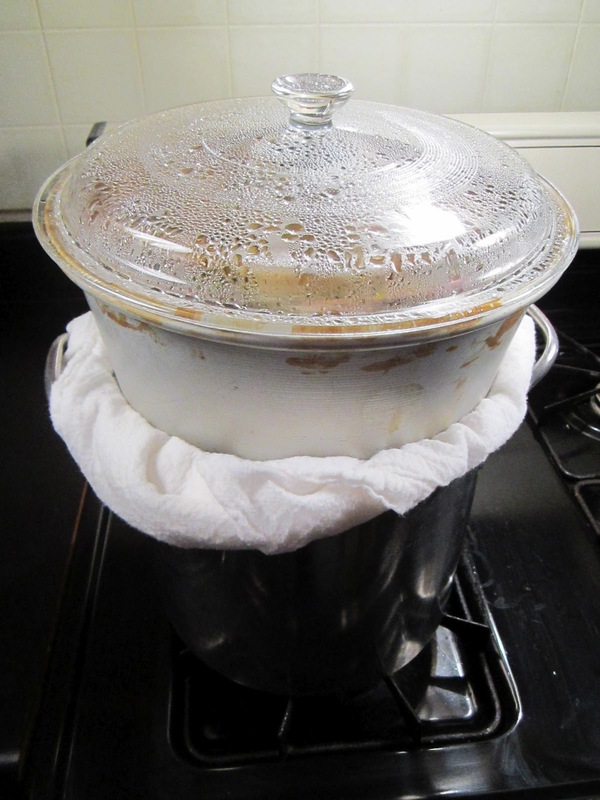 You're not concentrating the stock down, you're adding additional extraction agents steadily over time, getting more and more flavor into the broth and the food. Since none of the juices in the clay pot can escape, This broth does become very very rich, very very tasty in relatively short order. This is an excellent way to make a lazy Sunday meal when you don't want to work very hard and prefer to spend the time hanging out with your family. The preparation time is maybe 20 minutes, and soon after, the whole house smells wonderful, and you yourself begin to feel great that such a good meal is on the way. If you don't happen to have a Yunnan clay steampot, that is OK, you can still do this dish. You can approximate the ingenuity of the Chinese steam pot with a little ingenuity of your own. An angel food cake pan, a stock pot, some cheesecloth and a lid will allow you to give this ancient Chinese cooking secret a try. But I will warn you, there's no going back from that broth. I will bet you'll be wanting a steampot of your own once you taste it! I hope you enjoy this recipe and this little bit of history on Julia whose 100th birthday is Aug. 15. For more great posts about #cookingforJulia with PBS from the #sundaysupper bunch, see the links given below this method. Assemble the ingredients for your steampot. Below I have mushroom, onion, chicken, a little soy sauce and shaoxing wine, a one-inch piece of sliced ginger, two or three cloves of garlic, a red onion and some green onion, but you could put any ingredients you like in your steampot. Place chicken in a medium-sized pot of water and boil briefly. Pour off the water and rinse the chicken to remove any remaining scum. Put down a layer of green onions and top with the blanched chicken pieces. Add more green onions. Next place mushrooms over the chicken, a layer of red onions, ginger, garlic and any other desired spices. Basically, you put the longest cooking things on bottom and the shortest on top. Pour over this 1 T of soy sauce and 1/4 cup shaoxing wine. I added a pint of broth to this, but in retrospect, that was too much. The steam puts plenty of liquid into the pot in relatively short order. Next time I won't add any broth. Place the pan over a stock pot with water in it that has a cheesecloth wrapped around the top rim. This helps prevent steam from escaping the pot. You could also seal the seam with parchment paper but I think that sounds pretty messy. This worked well for me to keep all the steam in the pot. Put the lid on the pot and turn the burner on, bringing the water in the stock pot to a boil. 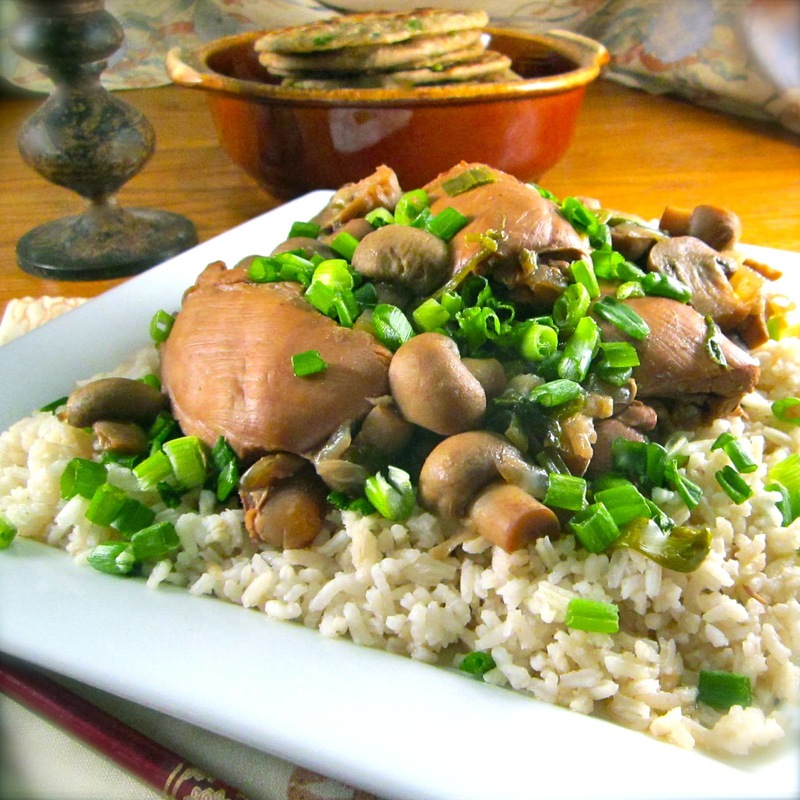 Reduce heat and simmer your steam pot chicken for 3 to 4 hours. Your house will begin to smell really good! Go ahead, taste that broth. After three to four hours, the chicken can be removed from the steampot. Serve with some rice and some scallion pancakes and enjoy. This is such a great dish, and so easy. I know I'm going to have to go and buy a steampot now! Here are more great recipes celebrating Julia Child's 100th birthday with #sundaysupper. Check them out! The fun starts every week at 3:00pm ET by showcasing fabulous recipes. At 7:00 pm ET, we will start our live chat. Join us on twitter by using hashtag #Sundaysupper or using Tweetchat. We love to feature your recipes on our #sundaysupper pinterest board and share them with all of our followers. See you there! I guess you are a Chinese food lover....this looks great. Love to see more Chinese recipe from you and thanks for sharing! Looks wonderful! I have not seen a steam pot like that until now. Yet another piece to add to my kitchen collection. Oh my holy shmoly, this looks awesome! I love the steam pot too! Looks so yummy !! Love the steam pot method ! So wholesome & Delish ! THis sounds amazing!!! I love all Asian flavors and food and would not have guessed this was A Julia Child recipe! Will have to try this! Just to be clear, Julia did not cook Chinese food. But she credits Chinese food with first awakening her interest in food, and it was in pursuit of Chinese foodie delights that she and Paul first began to associate and ultimately fall in love. @Heather I thought of it mainly I think because I didn't want to buy yet another cooking gadget that I only use once. I wanted to test it out first and see if it's a worthwhile investment. I can definitely say after this that it is totally worthwhile. This is a great cooking method for all sorts of dishes and I'm gong to be experimenting more with the steampot method for sure. I loved all this history of Julia!!! I think I could live off of only Chinese food, too. And your steam pot looks just fantastic...a new method that I'd love to try!!!! What a great story and this looks so delicious! Love the cooking method - I've never made anything like this before.